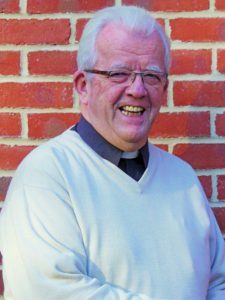 THE congregation at St Dunstan’s Catholic Church in Woking is mourning the loss of its parish priest, the Rev Canon Francis (Frank) Harrington. Father Harrington, known by most people as Father Frank, died at his home in the town on Thursday last week, aged 74. He had been parish priest of St Dunstan’s for more than 24 years and had worked in a number of parishes in the Diocese of Arundel and Brighton since his ordination in 1968. The man who preferred to be called just “Frank” was a big man in many respects, said a parish spokesman. “He was big not just physically but also spiritually and intellectually, and with a wonderful sense of humour,” he added. Parishioner Chris Trevor-Wilson said: “Fr Frank was a wonderful priest, much loved and highly respected, He had a powerful, bass voice with a strong Irish accent and an engaging, dry sense of humour. Fr Harrington was born in the village of Eyeries on the Beara peninsula in County Cork, Ireland in 1943. He trained for the priesthood at All Hallows College, Dublin and came to England after his ordination.